Why? While trying to build profitable relationships with target customers, management has to design a marketing strategy. But what philosopy will guide this strategy? How much weight is given to the interests of the company, customers and society? The marketing concepts classify these interests into five categories. Companies use these orientations as a basis for their marketing campaigns. How much weight is given to the different interests? Let’s look at each of the Marketing Concepts. The Production Concept is maybe the easiest of all Marketing Concepts. It is just about producing, and does not spent much effort on knowing something about the customer. It follows the idea that consumers will favour products that are available and highly affordable. Therefore, the aim of the organization is to improve production and distribution efficiency. The Production Concept is one of the oldest orientations. It may work in some cases, but entails the risk of focusing too much on the own operations and losing sight of the real objective of marketing – satisfying customer needs and building relationships. The Product Concept can also be considered as one of the simplest Marketing Concepts. It focuses totally on the product: nicer, better, cheaper…, but not on the customer and what he might need. In other words, it starts with a product and then tries to sell this product to customers, instead of starting with a customer and considering the needs and wants of this customer. An example is a TV remote control which has more than 50 buttons and is capable of everything, but does the customer really need and want it? It is based on the idea that consumers will favour products which offer the most quality, performance and features. Therefore, the aim is to improve the product. However, focusing too much on the product may also lead to missing the actual aim of marketing: Imagine you are a manufacturer of mousetraps. You design and produce the best mousetrap the world has ever seen, expecting that everyone will buy it. But does the world actually want to see your product, does it need this mousetrap, only because it is nicer, better, cheaper? The solution people are looking for might be a spray, an exterminating service or something else. So focusing only on improving your products does not mean success. The Selling Concept is, as the name indicates, all about selling, which involves aggressive selling to any customer. It is of minor importance who this customer may be, why he might need the product, which usually automatically leads to a short-term customer relationship. Consequently, the Selling Concept takes on an inside-out perspective, starting with the existing products and focusing on finding customers for these. In other words, it is all about selling what the company makes, following the idea that consumers will not buy enough of the company’s products unless it undertakes a large selling and promotion effort. There are industries where this concept holds and often is the only solution. Typically, it is practised with unsought goods, that is, products that consumers normally do not think of buying, such as insurances or blood donations. As said before, this carries the risk that the only focus is on creating a sale, but not on building profitable long-term customer relationships. The Marketing Concept, which is not to be confused with the overall topic of Marketing Concepts, is the first approach which can actually fulfill the needs of a marketing strategy: building profitable long-term relationships by maximizing value for the customer. Why? It is about knowing the needs and wants of target markets and delivering satisfaction better than competitors do. Consequently, the Marketing Concept takes on an outside-in perspective, starting with the customer needs, and aiming to find the right products for the customer. In other words, instead of the product-centred ‘make and sell’ philosophy, the Marketing Concept is a customer-centred ‘sense and respond’ philosophy. Instead of finding the right customers for a product it aims to find the right products for target customers. In contrast to the above explained concepts, the Marketing Concept yields more customer value by creating lasting relationships with the right customers, which is based on customer value and satisfaction. Societal Marketing – The best of all Marketing Concepts? While in former days, a company was a closed system, nowadays it has to be open. In other words, it has to consider what the society wants and will accept, now and in the future. The Societal Marketing Concept addresses these issues. Therefore, it is an advanced version of the Marketing Concept, questioning that the latter overlooks possible conflicts between consumer short-term wants and consumer long-term welfare. Therefore, the Societal Marketing Concept considers what the customer wants now, but at the same time looks at what society wants now and in the future, calling for the satisfaction of society’s long-term interests. It aims to meet the present needs of consumers and businesses while simultaneously preserving the ability of future generations to meet their needs. 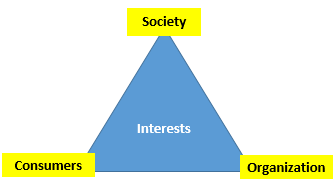 Factors that might be involved in this philosophy often aim at being socially and environmentally responsible, addressing issues such as pollution, employment conditions, safety, corporate social responsibility… Nowadays, the societal marketing concept may be the best of the Marketing Concepts, since it looks at the long-term interests of society and thereby forms a strong basis for an effective marketing strategy. However, it is also the most difficult one of all Marketing Concepts. Companies have to balance three considerations at the same time: the company’s profits, consumer wants, and society’s interests. As you have learned, the marketing management orientation a company chooses and applies depends on management’s interests and preferences. However, it is the basis of all marketing activities and determines how a company will deal with customers, customer needs, the design of products etc., and also how the company will be perceived by society. Therefore, the marketing management orientations are of crucial importance.